Tanya Chaly | NYC Arts! Vivid strokes of color in the form of endangered, extinct and fantasized creatures cover the studio walls. Against the white corridor walls, the decor is a welcome contrast. 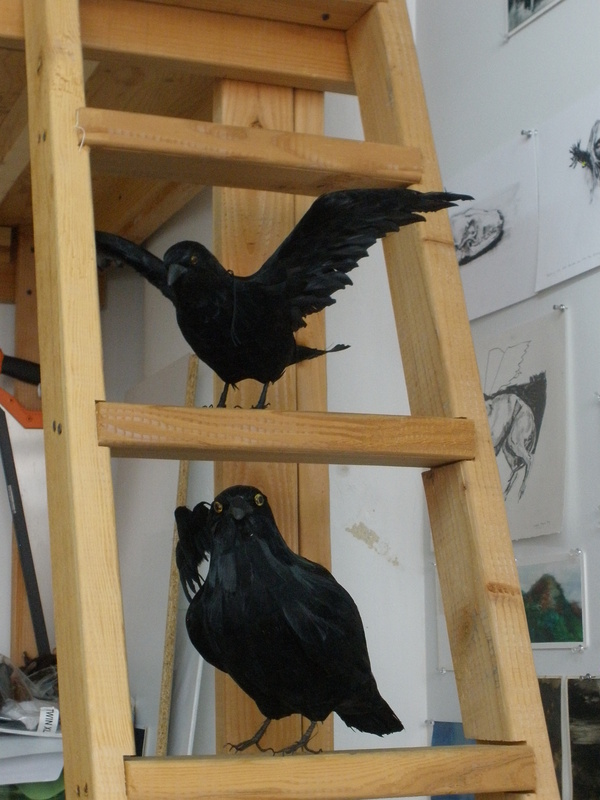 Two black crows perch on a wooden ladder and are so life-like that I jump before sheepishly realizing them to be sculptures. “Mint tea?” Tanya offers and, before I know it, I am sitting on a ladder of sorts as well, holding a cup that looks like it came out of Alice in Wonderland. Tanya falls easily into conversation. She had moved from Europe to the United States four years ago and, before that, Australia. 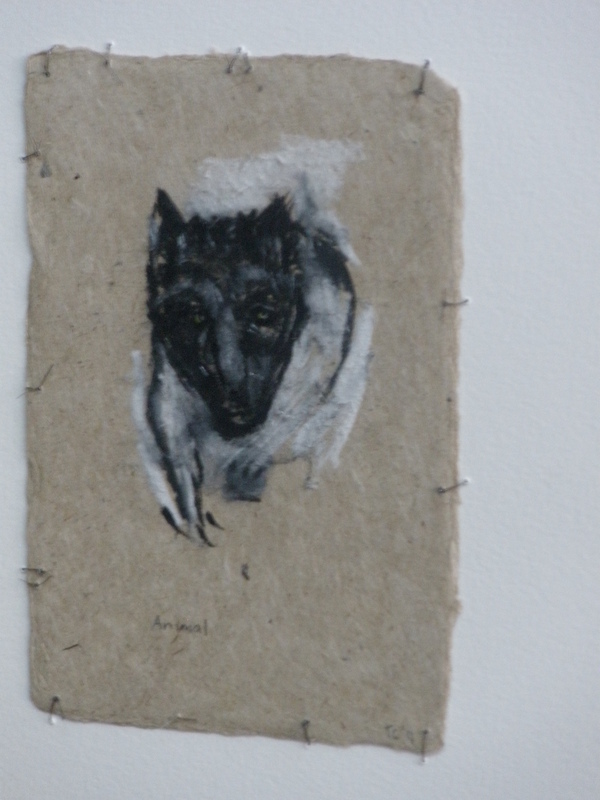 Her current project lies on her desk, a bird drawing on some leathery material, which she had been meticulously sewing to a beige cloth when I walked in. They are fine pencil sketches of birds perched in mid-air and hint at Native American influences. I cannot keep my eyes away. “We’re animals too and there’s an element we forget, our animal side,” Tanya says, and I wonder if that is what draws me to the piece. Or perhaps, it is the simplicity of it. Tanya depicts the birds without embellishment or abstraction. There is truth. Few people can draw still-lives well, and even fewer choose to leave their subjects in their unhampered original forms. Tanya falls into that small minority. “In Australia, you’re aware that you’re very small in the relation to nature,” she says. This upbringing influences her artistry. By depicting the animals as they appear in nature, instead of exercising the artistic right to abstraction, she shows her subjects respect. “We anthropomorphize animals,” she says, but her work allows these animals and, by extension, nature to exist outside human control. “Everything feeds back into itself… There are layers and levels that continue out,” Tanya says, speaking specifically of Native American spirituality, but the language also alludes to painting. For Tanya, the two realms cannot be separated. She identifies as a painter, and the fluidity, the layering of colors, the relationship of shape to texture inherent in this particular art form encourages painters to be aware of the connectivity in the world. Indigenous teachings espouse this philosophy as well. “No life system is completely isolated,” she says, while noting how the painted animals suggest something more in the landscape and how “broken up elements make up a bigger picture.” Today’s western culture has “lost a lot of those connections,” she says and attributes the current environmental degradation to this lack of awareness. “It’s actually your home,” she says, and though obvious, the reminder is desperately necessary. Leaving the studio feeling refreshed from both the tea and Tanya Chaly’s vivacity, I can only hope that more people may look at the detailed feathering of that macabre wing and, in the process, gain some wisdom. 27 Jun	This entry was published on June 27, 2011 at 9:37 am and is filed under LIC. Bookmark the permalink. Follow any comments here with the RSS feed for this post.